Are you sure it’s the right format to get your message ‘out there’? I ask because it’s important you’re not seduced by a particular advertising medium – until you’re confident it’s the right choice for the specific message to wish to communicate and the customers you wish to attract. The answer is entirely depends on what you want to achieve. So if you’re planning to create a leaflet, what are you planning to say? Leaflets can drive a good ROI if used in the right way. So don’t get hung up about the extra cost of print and distribution. If your leaflet drives your intended action then the investment will pay for itself in terms of sales, leads, and customers. In fact, fear of print and distribution costs are just holding you back – especially given the fact that a printed leaflet can help you stand out. As our online world becomes noisier, it’s not easy to get the right eyes on your message. An email can be deleted and we’re always hovering over the back button for a swift exit from a web site. While the TV, radio and internet can be switched off, when a leaflet lands it’s ‘there’ until physically moved. The power of print is its tangibility. A leaflet is something your customers can pick up and hold in their hands. It’s a piece of marketing that delivers a tactile experience. And let’s face it, our letterboxes are far quieter than our inboxes these days. 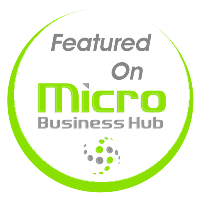 Consider your own email inbox, do you open every promotional email? Do these emails even get through, or are they instantly consigned to spam? A leaflet may just be seen where your digital message goes unnoticed – especially if your words are relevant and compelling. And if your leaflet offers something your recipient wants, there’s a good chance your it will lead to sales. So while leaflets might feel a bit ‘old school’, this has no bearing on their effectiveness. Take this… According to the Direct Marketing Association (DMA), 87% of consumers remember door drops while only 35% remember email. That said, it’s not enough to just ‘drop a leaflet’. It’s true that lots of leaflets do head straight for the recycling bin. Now, one reason for this is because the message hit a home that didn’t want or need what you’ve got. You can’t do much about this because that’s the risk of mass marketing. But a more common reason that IS in your control is because the content of the leaflet didn’t work. Remember, the many benefits of a leaflet campaign will be lost if the leaflet fails to grab people’s attention – and then convert the reader into a buyer. And the words you print WILL decide whether your leaflet flies or bombs. If you’ve decided a leaflet is the best way to communicate your message, you’ve GOT to nail your written content. Clarify your key message. What’s the main thing you want to communicate? Drive a specific action. Don’t be wooly. For your leaflet to drive a return it’s got to get your reader to do something. Is your ‘next step’ clear enough? As you can see there are plenty of things that could go wrong with your content – but then it does take skill and experience to produce a leaflet with the right mix of words that influence a person’s behaviour and encourages them to take the next step. Now if all this sounds discouraging, don’t be put off! As a skilled copywriter, I’ve worked with a wide range of businesses over the years and I’ve honed the most important lessons I’ve learnt about creating a leaflet (that actually works!) into a comprehensive guide. 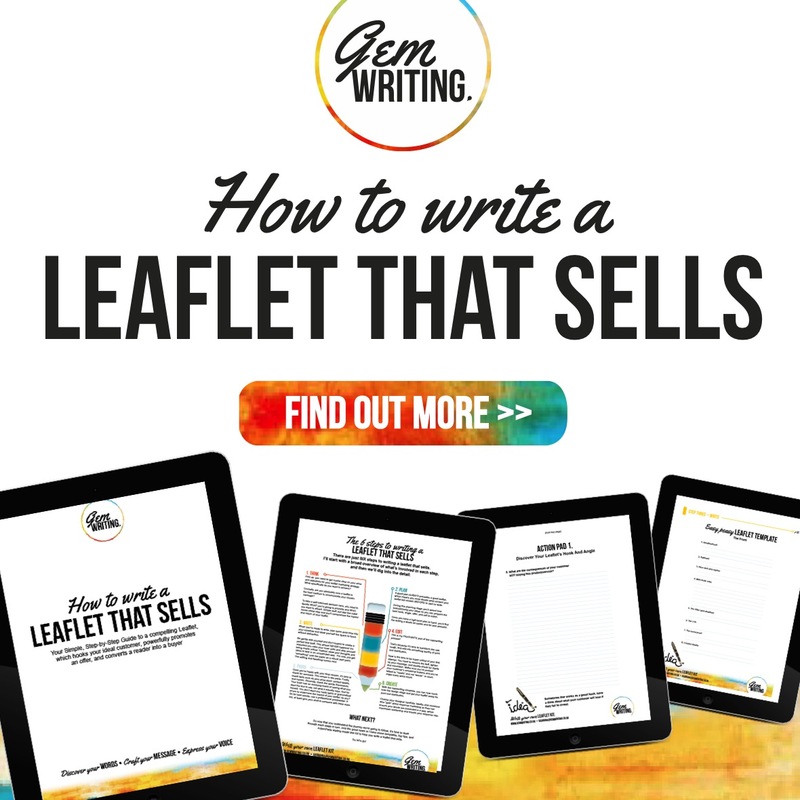 I’d love to help you craft leaflets that sell and that’s why I’ve made it easy for you to get your hands on this tool! How To Write A Leaflet That Sells is a detailed, step by step guide/workbook that details the thought process, which helps me write compelling leaflets. That’s everything from your headline, to your hook and angle, to the content for your body copy. It’s all very comprehensive. This workbook is 42 pages of high quality print and content. Once in your hands, it will help you create leaflets (or flyers) for your business that will make you proud. Here’s a quick picture to give you a flavour of what you can expect. If you’re planning to create a leaflet any time soon I encourage you to get your hands on this kit. It could save you a lot of wasted time and effort by ensuring you’e got all the important elements properly covered. To order your printed copy simply CLICK HERE. You can check out with PayPal and I’ll send you one by 1st class post. I’ll even throw in a dapper Gem Writing pen to help you get cracking. You’re going to LOVE it!